Be careful what you wish for, if that is what you wish for. Except for the oil shocks of the 1970s and a few other recessionary years, the US economy has generally been strong in the postwar era since 1945. Huge advances in technology and trade, a favorable business environment and strong demographics combined to create tens of trillions of dollars of new wealth in the US and around the world. The demographic component played an important supporting role. During the baby boom years, the number of Americans grew at an average annualized rate of 1.6% (see chart). In subsequent years starting in the mid 1960s, this growth faded to about 1% where it remained until 2007-08. Since then, it has fallen to 0.7% and, on current UN projections, it will continue to fall through 2050 when it may dip under 0.4%. 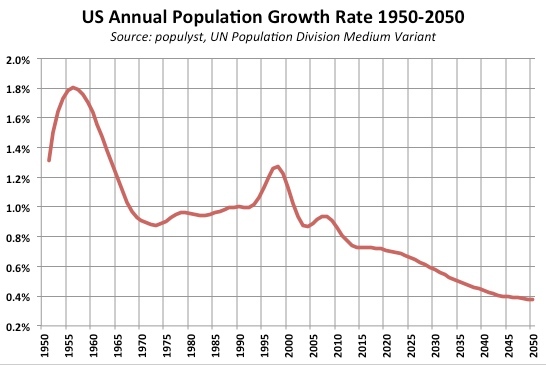 Put another way, the population grew 1% per year on average in the years 1950-2015 and is expected to grow at half this rate, or 0.5% per year, from today to 2050. As a result, the US population will be at 356 million in 2030 and 389 million in 2050, equivalent to 18 million and 67 million fewer Americans in those years than if the growth rate had remained on its historic 1% trajectory. What accounts for this slowdown? Mainly the boomer phenomenon. First, baby boomers had fewer children than their parents. The Total Fertility Rate (TFR = average children per woman) stood at near 2.0 in the 1980s and 1990s, compared to near 3.5 in the 1950s and early 1960s. Second, the number of US deaths will surge in 2025-45, echoing eighty years later the surge in births in 1945-65. Barring a leap in life expectancy, this death boom will put the brakes on demographic growth. 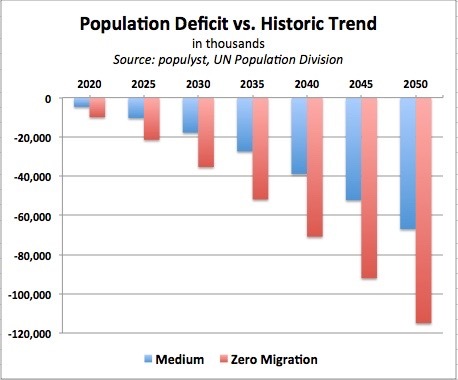 So even before we start talking about immigration, the US population will be slowing down and slowing down by a big number, recording a shortfall or “deficit” of 67 million vs. the historic trend by 2050. In addition, the aging of the population will create another challenge with a rising dependency ratio (number of dependents per worker) reducing discretionary spending and investing, and straining pensions and entitlements. On current trends, the dependency ratio is expected to rise from 50.9 in 2015 to 65.8 in 2050. This ratio was at 66.5 in 1960 and its subsequent decline in four consecutive decades provided a big boost to the US economy. It is important to highlight the demographic shortfall vs. the historic trajectory because some of today’s more extreme anti-immigration rhetoric is being presented as a promised return to the better economic conditions of the past. These conditions can be recovered through other paths but not through measures that exacerbate the population slowdown. Indeed if we judge by the figures above, it is clear that returning to the past is not in the realm of the possible, at least as far as demographics are concerned. 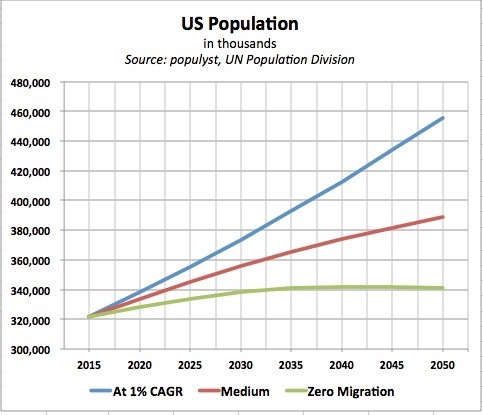 In order for the US population to grow at 1% again without immigration, the birth rate would have to jump to levels not seen since the baby boom or higher. Even then, the dependency ratio would climb more steeply for two decades because of the millions of new babies. The US economy can and most likely will have a bright future but it cannot count on population growth to fulfill its historic supportive role. The economy benefited for decades from the demographic sweet spot of a rising population and a declining dependency ratio. Neither of these measures will be as supportive in the future. Instead greater gains will have to come from technology and automation and from investments in productivity and education. 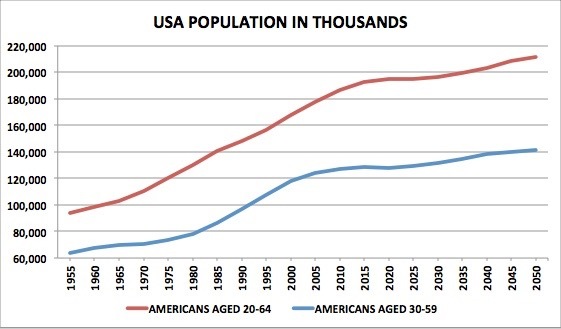 This chart shows the number of Americans aged 20-64 and 30-59 under the Medium scenario. The working age population (20-64) is expected to remain flat for fifteen years and then to grow at a lower rate than in the past. This population would decline under a Zero Migration scenario. While it is true that automation will take over a number of functions and would dampen the impact of a stagnant or falling work force, demand for goods and services would certainly take a hit unless new export markets are opened up. 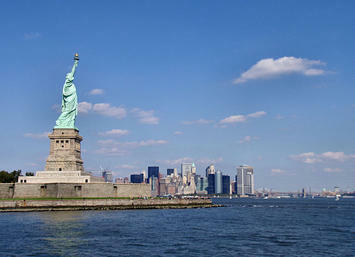 For more on the role of demographics in the economy, we suggest that you listen to this podcast. It should also be remembered that world demographics are far from standing still. See here and here or consult the Populyst demography archive.